Some astronomers think this alleged planet, called Planet Nine, exists because of the way some objects in space, called "Trans-Neptunian Objects," or TNOs, behave. These TNOs are rocky objects smaller than Pluto that orbit the sun at a greater average distance than Neptune. But the orbits of the most distant of these TNOs—those whose average distance from the sun is more than 250 times as far as Earth's distance—seem to point in the same direction. This observation first led astronomers to predict the existence of Planet Nine. For these TNOs to be aligned in the orbits they currently occupy because of Planet Nine's influence, astronomers say, they would have been in the solar system for longer than a billion years. However, some astronomers think in that amount of time, some of these objects should have either smashed into another planet, been thrown into the sun, or ricocheted off into space by other planets' gravitational force. The U-M research, led by Juliette Becker, a graduate student in the Department of Astronomy, consisted of a large set of computer simulations, which uncovered two findings about these TNOs. First, the researchers established a version of Planet Nine that would most likely cause our solar system to look the way it currently does, by preventing the TNOs from being destroyed or thrown out of the solar system. Second, the simulations predict that there is a process that they call "resonance hopping" by which a TNO jumps between stable orbits. This process can prevent the TNOs from being ejected from the solar system. In each individual simulation, the researchers tested different versions of Planet Nine to see whether that version of the planet, with its gravitational forces, resulted in the same version of the solar system we see today. "From that set of simulations, we found out that there are preferred versions of Planet Nine that make the TNO stay stable for longer, so it basically increases the probability that our solar system exists the way it does," Becker said. "Through these computer simulations, we were able to determine which realization of Planet Nine creates our solar system—the whole caveat here being, if Planet Nine is real." 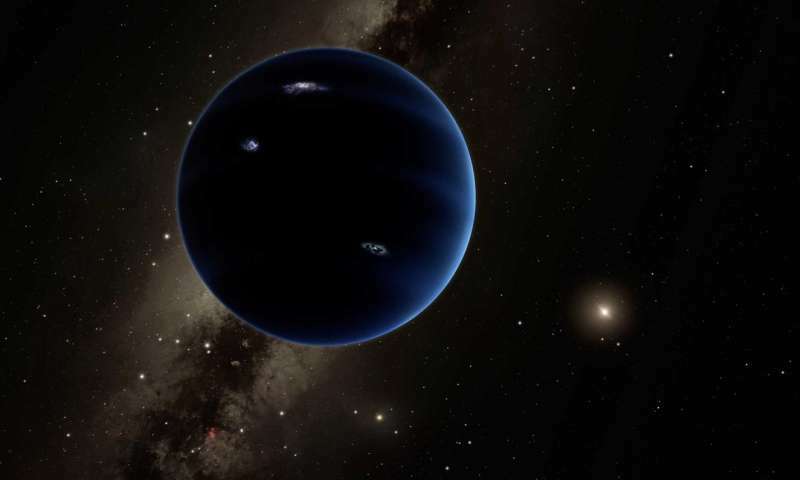 The group, which includes U-M physics professors David Gerdes and Fred Adams as well as graduate student Stephanie Hamilton and undergraduate Tali Khain, also examined the resonance of these TNOs with Planet Nine. An orbital resonance occurs when objects in a system periodically exert gravitational forces upon each other that cause the objects to line up in a pattern. In this case, the researchers found that occasionally, Neptune will bump a TNO out of its orbital resonance, but instead of sending that TNO skittering into the sun, out of the solar system or into another planet, something catches that TNO and confines it into a different resonance. "The ultimate goal would be to directly see Planet Nine—to take a telescope, point it at the sky, and see reflected light from the sun bouncing off of Planet Nine," Becker said. "Since we haven't yet been able to find it, despite many people looking, we're stuck with these kinds of indirect methods." Astronomers also have another newly discovered TNO to include in their indirect methods of detecting Planet Nine. The Dark Energy Survey collaboration, a large group of scientists including several U-M scientists, has discovered another TNO that has a high orbital inclination compared to the plane of the solar system: it is tilted about 54 degrees relative to the solar system's plane. In an analysis of this new object, Becker and her team have found that this object experiences resonance hopping as well in the presence of Planet Nine, showing that this phenomenon extends to even more unusual orbits. A few years ago I remember reading an article conjecturing that there was a planet missing between Jupiter and Uranus, disturbed and displaced by the outward migration of Jupeter early in the history of the solar system. Does planet 9 fit the bill for this missing planet ? We've found Planet Nine already. Depending on which geophysical definition of planet you subscribe to, it's either Neptune or Pluto. Please refer to this hypothetical world by the standard term used for a theorized but undiscovered planet, which is "Planet X," with "X" referring to the unknown, not to the number 10. If this world exists, it is not the solar system's ninth planet, as the solar system already has a minimum of 13 planets and counting because dwarf planets are planets too, as intended by the scientist who first coined the term, Alan Stern. If discovered, this planet would be at minimum Planet 14. The term "Planet 9" is a loaded term deliberately chosen by Mike Brown to promote his own agenda of having "killed" Pluto; it inherently denies the ongoing debate of how to define the term "planet" and the number our solar system has. Wasn't it a 50's, Ed Wood Sci-fi movie? I'll wager we've hardly scratched the surface in TNOs. The Oort cloud is likely to be full of them, but we won't have the technology to spot them for decades. I think the way they define it now is not with dwarf planets being planets. It's two separate categories, "dwarf planets" and "planets". By "they," I think you mean the IAU. If so, you're correct, but the IAU is not the whole of the astronomical community. Most planetary scientists (as opposed to astrophysicists) continue to regard Pluto, Eris and other objects that geophysically are planets as planets. The term "Planet 9" is a loaded term deliberately chosen by Mike Brown to promote his own agenda of having "killed" Pluto; it inherently denies the ongoing debate of how to define the term "planet" and the number our solar system has. How did he "kill" Pluto? Isn't it still up there, right? It's just not a regular planet like they used to think. Brown likes to go around bragging that he "killed Pluto" (as a major planet). By "they," I take it you now mean astronomers (a set of which the IAU is only a subset). "They" are divided. The official position of the IAU is that Pluto is not a planet, but most planetary scientists,according to Alan Stern, continue to regard Pluto as such. This issue has been controversial in the astronomical community from the beginning. Several hundred astronomers signed an open letter stating that they disagreed with the IAU's definition of planet and would not use it, almost right after it was issued. If it was, I wanna see it!